We completed our Firefly rewatch a few weeks ago, so we've moved on to Farscape, which holds a special place for J and I because it's what we used to watch every Sunday afternoon when we started dating. I figured he was just watching it to get in my pants, but a decade later, it seems there was more to those Sundays than I suspected. I first caught Farscape when YTV picked it up, late nights on Fridays. YTV is a kids network, and, because Farscape had puppets, some assumptions were made. It was soon removed from YTV and eventually found its way to SPACE. Canada was ridiculously behind on the broadcasts, but we got there eventually, and we're glad we got to go along for the ride. It's not often that you get good sci fi shows that don't cop out on the crazy, the nerdy and the alieny. I suppose the fact that the show was more or less Made in AustralianTM explains that. Farscape also mastered the concept of epic. 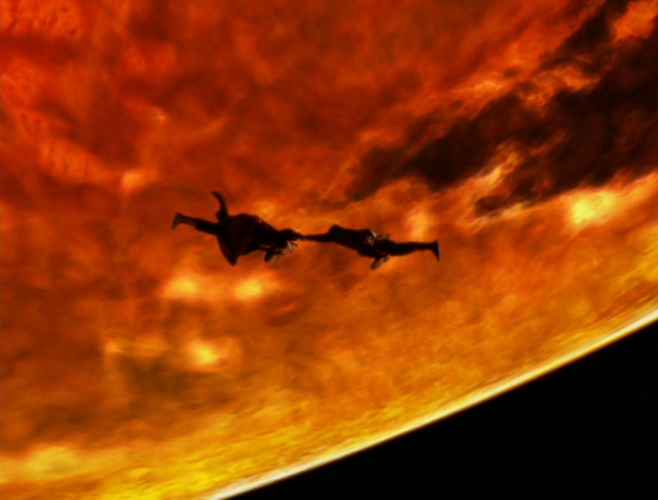 In fact, with season finales where your main characters are literally floating and almost dead in space with an exploded planet behind them, I'd almost believe that the word "epic" was created because of Farscape. Unfortunately, we had to put a pause on our marathon. Farscape has this crazy way of getting into your imagination and therefore into your dreams. But while I'd like my dreams to feature a lot more Aeryn Sun, I keep getting stuck with Scorpius. Don't ask. (Though I do loves me some Harvey).